SPEED, STUNTS AND EXPLORATION! Personal Watercraft are powerful machines – treated with respect, they are wonderful for fun on the water and to explore the coastlines of Wales. Wales has calm waters as well as stunning coastal features – both natural and man-made – waiting for discovery. 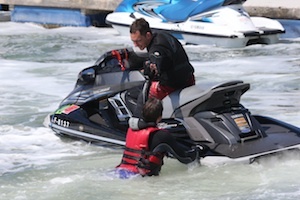 The country offers personal watercraft brokers, courses, and spares and repairs for all types of personal watercraft, as well as on-water toys such as towing inflatables and skis. Browse personal watercraft businesses here.